Redefining the essence of opulence and luxury of The Wagington Suites. The Wagington offers a rarefied experience for those whom are accustomed to the finest in life. Averaging 15 to 96 square foot, each suite is complement with sumptuous furnishings, quality handcrafted soft faux leather orthopedic beds and high definition web cam. Redefining the essence of opulence and luxury of The Purr-fection Feline Suites. The Wagington offers a rarefied experience for those whom are accustomed to the finest in life. Averaging 15 to 96 square foot, each suite is complement with sumptuous furnishings, quality handcrafted soft faux leather orthopedic beds and high definition web cam. 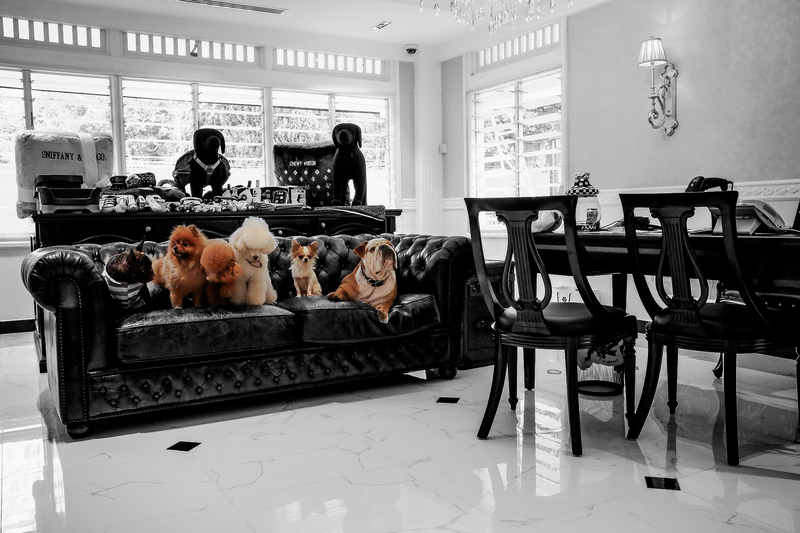 Quintessential Dog Luxury! Unquestionably Singapore most inviting dog pool. Bone Pool @The Wagington is secreted away among the verdant, lush foliage amidst the ambience of the hotel and feel absolutely refreshed in this outdoor haven. Take a refreshing dip in the 1.2m deep refreshing waters. The distinctive resort courtyard settings for yours for the taking. Absolutely everything you need and want for a most satisfying day out @The Wagington. For the fun and fitness enthusiasts, we have an array of activities for your pet. This promotes physical, mental and emotional health! Excellent for releasing pent up energy, fabulous for keeping fit and burning those extra calories. Explore places with us in our new pet transport service! - Designed in style with our pet hotel mascot, Bobo, the skateboarding bulldog. With an interior that offers sheer refinement and absolute comfort, our pet limo is available to hire for pet guests and their owners who have a penchant for arriving in style. Our concierge would be delighted to organise a pick up or drop off transfer to The Wagington. If you would like to take your pet for an excursion or to a specific location for your pet outing, please call us at +65 64711689 to further assist you.